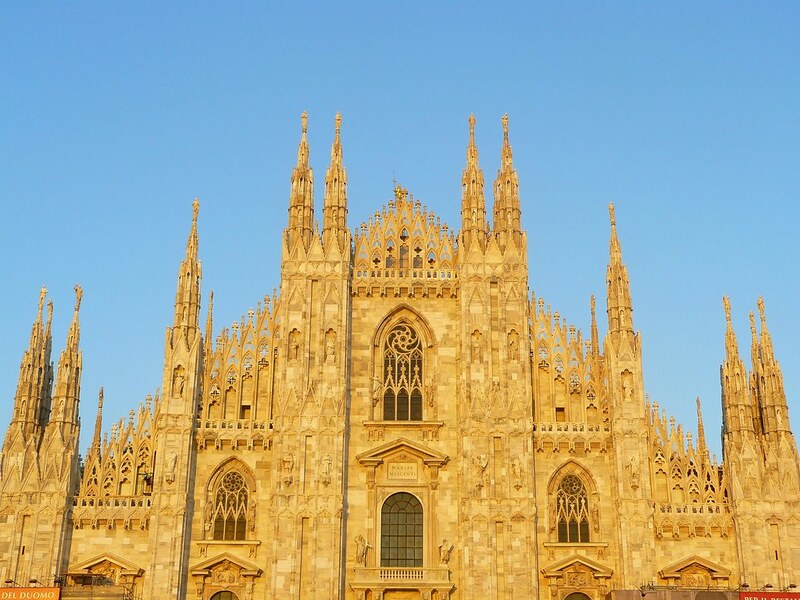 On our 2nd day in Milan, we went (again) to piazza Duomo. Not to enjoy the piazza, but to go inside the basilica Duomo (Duomo di Milano). The top roof of the basilica holds an amazing view of its surroundings. And my camera and I just didn’t want to miss a thing !! Another time had to be wasted back in a queue just to be able to get inside the basilica. But all the waiting and queueing were paid off. It really really was an amazing feeling being on the top roof of the basilica. Of course inside of the basilica was also great. The marvelous thing about this basilica is that it is made entirely from the marble. The great and grandiose of this basilica took about more than over five centuries to build. After spending quite some times to do some photographing, we took off for a lunch. We went to via Dante, the one of the famous streets in Milan that is so cozy and nice place to eat and drink outdoor. Cafe Dante was our choice to have lunch. From cafe Dante, we went to the big and famous castle in Milan; Castello Sforszesco. It really really was a big castle. I even couldn’t imagine how the princes and princesses lived their life in such a big place like that. From the castle of the Sforza family, we went to Santa Maria delle Grazie, a church where the painting of Leonardo da Vinci’s Last Supper was painted there. Not to be sad about that fact, we pleased ourselves with the information about the painting put on the board. Interestingly, we learnt something about the painting; as the Last Supper was painted on the wall, when the area was bombed on 1943, they saved the work by put lots of sandbag to cover all the wide wall. Thank to those who had the idea of doing that, now we’re able to enjoy the painting that becomes one of the Christian icon at houses besides the Holy Cross. From there, we went back to hotel to have some rests. In the evening, we went back again to via Dante, to have our dinner and to taste the night scenery of piazza Duomo. An interesting fact we found out in Milan is that though there’s quite many immigrants wandering around in the city, but this city is relatively safe to walk at night. Drinks and food are also a lot cheaper here than in Venice. Though we must admit, only mineral water and coffee that are cheap. Another kind of drinks are expensive. Take an example, it cost us 8euro for a glass of beer while in supermarket (thank God we have supermarket in front of our hotel), it cost only few euro cents. Another remarks I almost forgot to tell you is that in Venice and Milan (I think this is valid for all places in Italy), when you go to cafe or resto for dining, you’ll pay different if you choose to stand up instead of sit in. When you prefer to sit during dining, you’ll get extra charge for the table. It’s called Coperto. In Milan, coperto is 1.50 – 2 euro per person. In Venice, it’s even higher than that. We went back to hotel with a satisfied pleasure. After few minutes of packing, we’re ready to fly home.